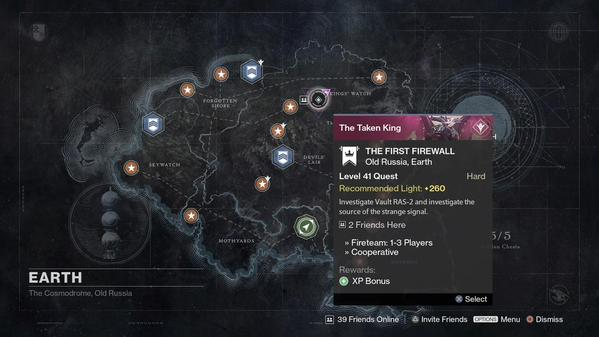 Note that the mission “The First Firewall” is only available if you collected and turned in all 4 DVALIN relics by 10/7. If you met the requirements, the mission is still open! It does not require you to visit Banshee to get a quest. Simply go to the director, select Earth, and start the mission. According to Bungie’s twitter, this mission is only available today, until the next time it cycles back around. If you’ve collected the items needed to unlock it, The First Firewall is in your Director today. If you haven’t, it will return in time. Completing the quest awards the Curious Tranceiver, which goes to your quest items and then requires 4 sequential passcodes. The passcodes appear to be identical to the order the knights spawn in the First Firewall mission (with Knights and Taken knights representing different values). After 4 passcodes you get access to a new mission called Shadow Call which requires you to reach the top of the Devil’s Spire (Cayde’s Stash mission location) within a time limit to collect your reward, which is the IKELOS Fusion Core. The Fusion Core requires 5 modules to be repaired. Heavy Power Coupling – Dismantle any legendary or higher heavy weapon. Ionized Shell Harmonics – Complete the Archives mission on Venus on any difficulty. WARSAT//MK19/TERRA/RSPN – Complete a ‘Defend the Warsat’ public event on Earth. WARSAT//MK19/LUNA/RSPN – Complete a ‘Defend the Warsat’ public event on the Moon. WARSAT//MK19/MARS/CHLM – Complete a ‘Defend the Warsat’ public event on Mars. For help finding Warsat events, check out www.destinypublicevents.com. Note that the Warsat at the beginning of the Fallen S.A.B.E.R. strike does not count towards your Earth Warsat completion. Completing all 5 modules awards you with the Reassembled IKELOS Fusion Core, which must be brought to the Gunsmith. Turning it in results in a dead end, and it seems most likely that the next step is time gated. After a daily reset, the gunsmith should present you with a quest called ‘The Sleeper Stirs’ which requires you to complete a special version of Fallen S.A.B.E.R. (Light 280 w/ Epic). Completing the strike awards the Sleeper Simulant Weapon Frame which you need to bring back to the tower. Returning to the tower and talking to Banshee awards the final reward, the SLEEPER SIMULANT. We’re done! Is there a way to check how many DVALIN relics I’ve collected? Unfortunately, no. But they’re not exceedingly rare. If you’ve been playing your character regularly in PvE activities and haven’t seen one pop up in a few days or more, you probably have all of them already. Is Gunsmith rank related to this in anyway? No. Multiple people have reported receiving the quest even at Gunsmith rank 0. People as high as rank 5 have also reported completing the quest and still not being able to advance. At this point it looks like Gunsmith rank has no bearing on the quest whatsoever.